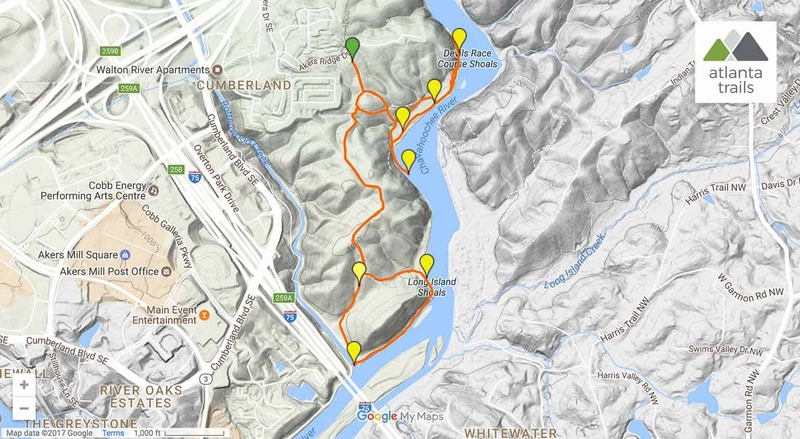 Hike or trail run the scenic riverside West Palisades Trail on the Chattahoochee River from the park’s Akers Drive trailhead in metro Atlanta. 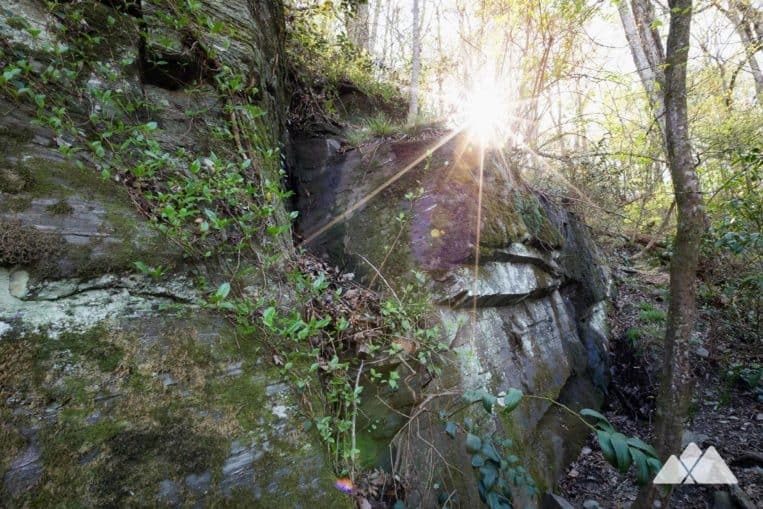 Beautiful, wide river views in a blooming forest, with rocky bluffs and sandy shorelines on the banks of the Chattahoochee River: the West Palisades Trail is easily one of the most scenic in-town hikes in Atlanta. And this four-mile loop covers this park’s highlights on a series of unpaved trails, looping through a young, vine-covered hardwood forest, catching stunning views of the river, and visiting rocky bluff overlooks. 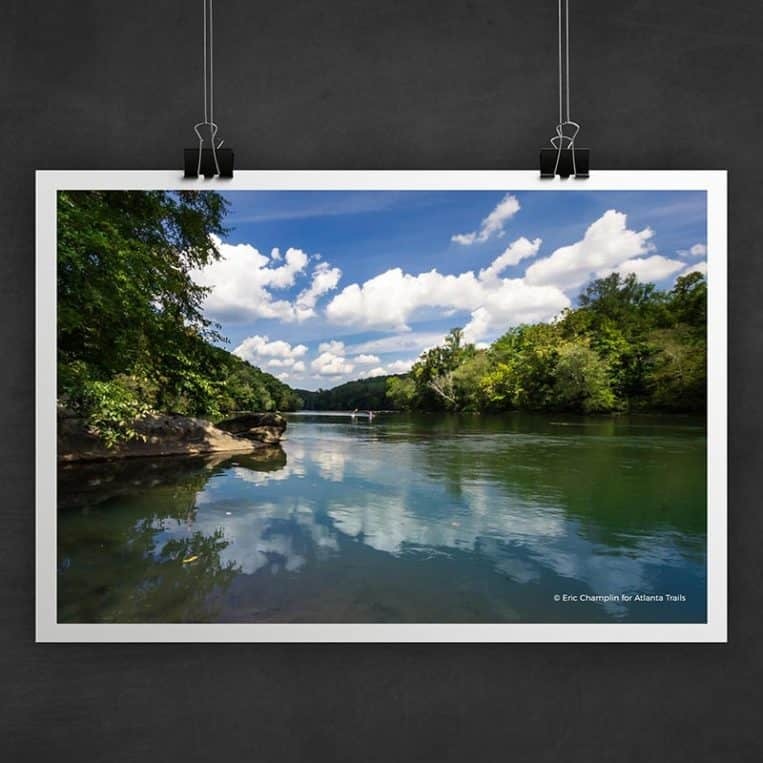 The Chattahoochee River National Recreation Area offers some of our favorite running and hiking trails in metro Atlanta. The grand river flows from the rolling Appalachian Mountains to the north, with humble beginnings at a small spring at Chattahoochee Gap, just off the Appalachian Trail near Helen. Through the city, the Hooch flows broad, alternating in stretches turbulent, rocky whitewater and mellow, glassy flow. And this hike is one of the river’s most scenic, making for a fantastic hike or trail run through some beautiful terrain near Vinings. The adventure begins at a trailhead off Akers Drive (view maps and driving directions), diving into the forest after skirting around a metal gate. The trail splits at .1 mile, and this route forks to the left. The trail follows a southeast-bound descent toward the Chattahoochee River, crossing a gravel road. Nearing the river’s banks, the route takes a left, hiking parallel to the river in a northeast direction, reaching a sandy beach on the river’s banks at .6 mile. Stairs offer river access to kayaks and canoes amid the whitewater-filled, jagged rocks at Devils Racecourse Shoals. The hike doubles back and turns southbound, following the Chattahoochee River’s flow as it approaches a wide meander. Riverine wildlife, including heron, geese, and an occasional deer, are a common sight along the trail. The hike reaches a wooden boardwalk at 1.1 miles, crossing through a small wetland. The hike continues its southbound trek. The trail narrows as it traces the shores of the rover, scrambling over rock outcrops. The hike reaches a rocky bluff offering views of the wide-flowing, glassy river at 1.25 miles. Departing the rocky overlook, the hike turns northbound, retracing its steps toward the marsh. The trail hike left on the paved forest road, climbing elevation as it travels due west. The hike turns left at 1.6 miles, trekking southbound, continuing to climb and beginning the trail’s large southern loop. 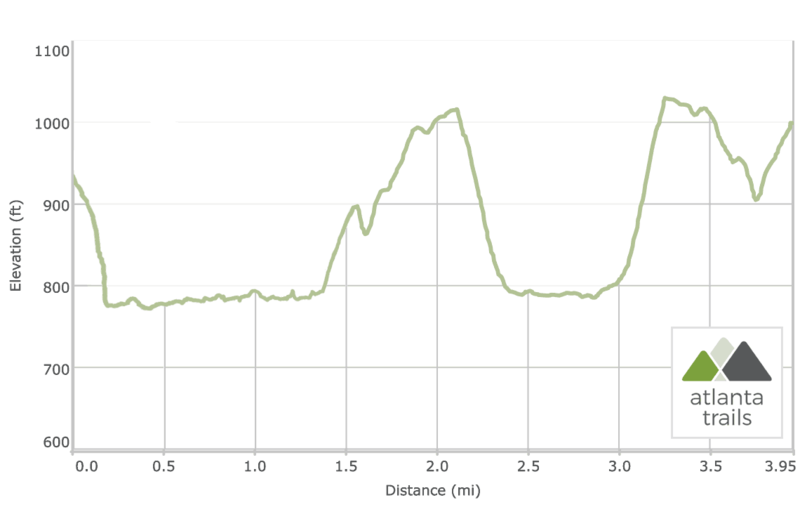 The route continues to climb, passing several side trails before cresting at 2.1 miles. The trail splits here. This hike veers left to descend eastbound toward the Chattahoochee River, crossing several small streams. 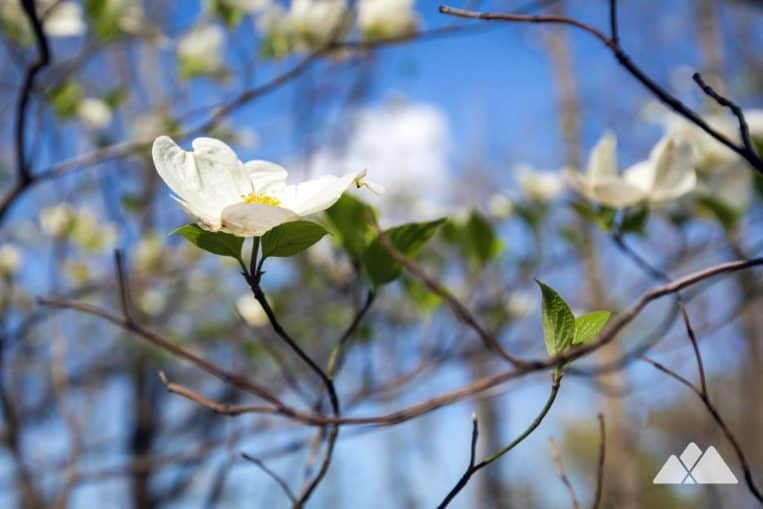 Dogwood trees pepper the forest with white blooms in the springtime, a beautiful contrast to the forest’s vibrant green and orange hues. The hike turns right at a trail intersection near the river’s shore at 2.4 miles, scrambling over a large rock outcrop at Long Island Shoals, a favorite swimming hole for our water-loving four-footed trail buddies. The trail meets the paved Paces Mill Park Trail at 2.8 miles, turning right to follow the pavement briefly, and darting back into the woods on a dirt trail at 2.9 miles. The hike climbs sharply northbound, cresting at 3.3 miles. The hike rolls elevation through the forest on its final stretch, retracing its outbound steps to the trailhead. The hike reaches the Akers Drive trailhead at 4 miles, completing the adventure. The river’s stretch through the Vinings area is one of its most scenic in metro Atlanta, and the area’s hikes have always topped our favorite lists. Just across the river, catch stunning views from a towering bluff and explore a bamboo grove on the East Palisades Trail. Run a flat 5k loop at the ultra-scenic and ultra-popular Cochran Shoals just north of West Palisades. Explore a historic island and homestead remains on the Powers Island Trail. 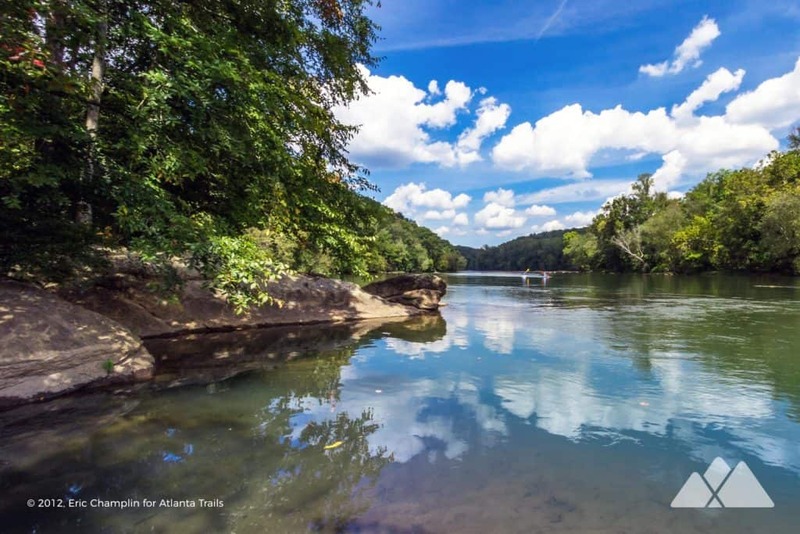 And check out our top ten favorite hikes on the Chattahoochee River for even more adventures. This trail is maintained thanks to the hard work of countless volunteers and donations from supporters of the Chattahoochee Parks Conservancy. Please support them by making a donation or joining a volunteer day. Let's work together to keep these fantastic trails maintained and open for use! $5 day pass, or included with a Chattahoochee River NRA annual pass.